Azerbaijan has become one of the most powerful players in the energy market, Azerbaijani MP, member of the parliamentary committee on economic policy, industry and entrepreneurship Rufat Guliyev said. Guliyev was commenting on the speech of Azerbaijani President Ilham Aliyev at the ceremonial meeting of the Azerbaijani parliament on the occasion of the 100th anniversary of the Azerbaijani parliament. “While delivering speech in the parliament, President Aliyev stressed that Azerbaijan connects the Caspian Sea with the Black Sea and Mediterranean Sea via oil pipelines, while Azerbaijan is connected with Europe via gas pipeline,” he added. “The keynote speech of President Aliyev can be described as ‘Azerbaijan always fulfills its tasks’,” Guliyev added. "This concerns the Contract of the Century and its prolongation,” he said. “This also concerns the construction of pipelines, including Trans-Adriatic Pipeline and Trans-Anatolian Natural Gas Pipeline, our goals to turn Azerbaijan into a transport hub and our foreign economic activity." 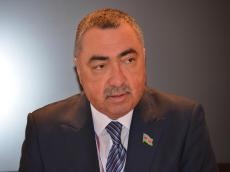 “At the same time, the development of the non-oil sector is also important for Azerbaijan,” he said. "We have taken a course for development of the non-oil sector. Special attention is paid to the formation of both an import-substituting model and an export-oriented one." Guliyev stressed that Azerbaijan’s all macroeconomic indicators are growing. “Today, Azerbaijan is a country developing not only its economy, but also actively investing in other countries, such as Turkey, Slovakia, Slovenia, the Czech Republic, Ukraine, Kazakhstan and others,” he added. Speaking about the economic development of Azerbaijan over the past 15 years, Guliyev added that Azerbaijan has greatly left behind many other countries in terms of development. “Azerbaijan’s economy is successfully developing thanks to its socio-economic development model,” he said. As an example, the MP stressed that even in 2015-2016, during the hard economic processes worldwide, Azerbaijan was able to neutralize external shocks. “This year, GDP growth is projected at two percent,” Guliyev added.